This section deals with the maintenance and rehabilitation of roads suffering from peat related problems and summarises the main processes that should be followed surveying, assessing and carrying out these types of work on peat. Stages 1-3 can cost around 2-4% of the overall cost of a project, depending on the size of the works, but is always money well spent in producing the best long term solution. Sufficient resources should always be allocated to these stages to ensure that all problems underlying the damaged road sections are correctly diagnosed, and the most appropriate solution chosen. Importantly, any data gathered is never just a “single-use” investment. Data, once collected, is capable of being utilized in many ways for many years not only in the design and rehabilitation of roads but also for the performance management of the completed road structure over its lifetime. With good monitoring and record keeping the data can be kept on file for future works to be used as a reference source, increasing the collected experience, and identifying any trends in the growth of defects. It is recommended that all of the information collected should be saved with its linkages, GPS or similar, so that it can be re-accessed and assessed jointly again in the future. With the collected survey data in place the next phase, an “integrated analysis”, can be commenced to understand the underlying problems. “Integrated analysis” brings all of the relevant survey data (Chapter 6) together in one place for analysis and design. [Link to Permanent Deformation 4.1.11. Integrated analysis of road survey results] Combining the survey data in this way permits the best possible opportunity to ‘diagnose’ the local underlying problems and their causes at the site. All of this information is presented to a common GPS origin to allow the analysis of the data in one location without the complication of having to refer to a range of independent reports and sections with different referencing systems. This is the real strength of the ‘integrated analysis’ system and offers significant savings in time and effort over traditional systems of analysis. Additionally by knowing the precise location of the particular site and defects, and implementing precise rehabilitation measures based on their causes, unnecessary work can be avoided. The overriding basic rule in any local road rehabilitation over peat is, in addition to trying to improve the existing circumstances, not to do any work to the existing road/peat balance that will cause further damage. Or, to put it more simply, ‘to do no more harm’. 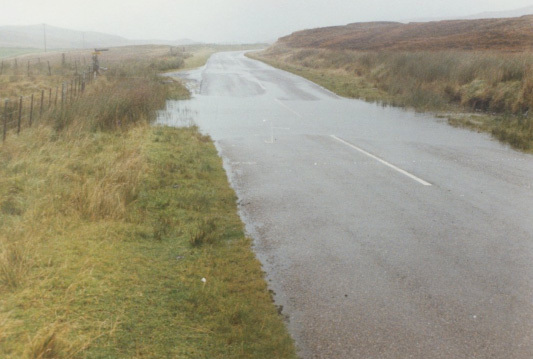 One of the positive features of an existing road over peat is that the peat below the existing road will normally have been loaded over time and increased in strength such that it can support the weight of the road. This will be the case even with a road that is suffering from settlement. 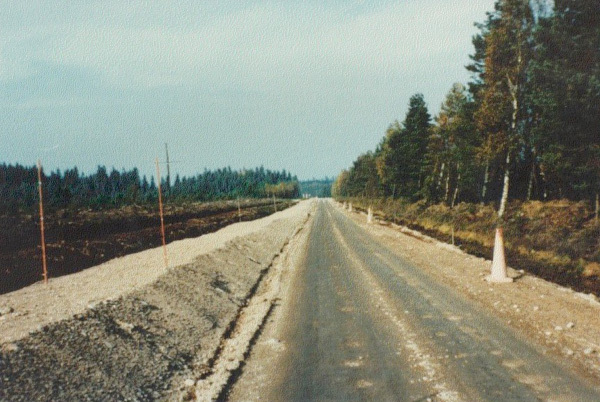 This increase in strength in the peat below the road, essentially a long term ‘preloading’ of the peat, can be used to advantage in the rehabilitation of the road, provided that nothing is done that causes further consolidation to be triggered, unless it is by deliberate design where the consequences are known and accepted. Execution – how will the works be tackled. A rehabilitation using steel grids will need to have the grid installed across the full width of road, approx 30cm deep, without a longitudinal joint. This may not be possible with live traffic flows and it may be necessary to build on top of the existing road and accept that settlement that will happen. Construction vehicles – how will the heavy construction traffic affect the road? Work cycles will have to be planned in detail to ensure that sufficient strength is avaialble within the road to support the planned construction activities. The final decision on the choice of rehabilitaion option will be a balance of the available engineering solutions and their effects. In the normal course of events a position of equilibrium builds up between a road embankment on peat and the underlying materials whereby the peat gains sufficient strength through the release of porewater, and consolidation, to support the weight of the road. This state of equilibrium is important for the long term performance of the road. Any disturbance to it, once the equilibrium has been established, will affect the road/peat balance and restart consolidation and settlement again. In this, lowering the groundwater table, such as with a new roadside drain, can have the same effect as adding weight to the road. When the groundwater table is lowered below a road on peat the hydrostatic uplift on the road, its “buoyancy”, is reduced and the drained road thereby becomes effectively heavier. This results in a heavier load being placed on the underlying peat and consolidation and settlement being triggered. In the example above, lowering the water table by 1.0m will cause an increase in load of 8kN/m² on the peat. Lowering the water table by a more modest 0.5m will cause an increase in load of 4kN/m². These changes in water level will take time to happen, and the embankment will respond incrementally as the water table is lowered, but the effect in the long term will be the same. The load on the underlying peat will be increased and a settlement will occur. The preferred option with roads on peat is therefore not to affect the established hydrology of the area. 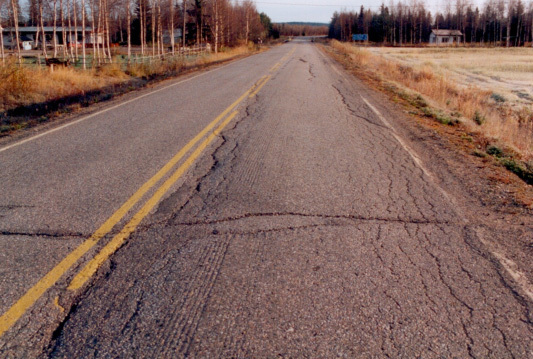 Peat related problems in carriageways can show up in a number of forms; uneven road surfaces, settlements and differential settlements, longitudinal and transverse cracking, edge deterioration, asphalt disintegration and others. 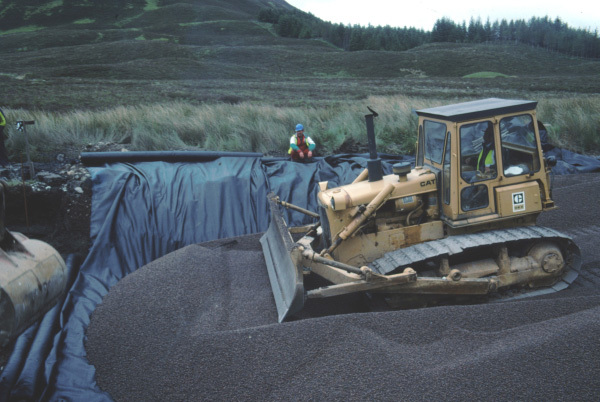 Overlaying road surface defects with new material seldom works on peat subgrades as the additional weight of the new overlay layers will only increase the loading on the peat. This quickly produces further consolidation and settlement, and further defects. The weight of materials in the new road construction should be less than, or equal to, the weight of the materials removed from the road. Where this can be done the rehabilitated road should impose the same load, or lower, on the underlying subgrade. 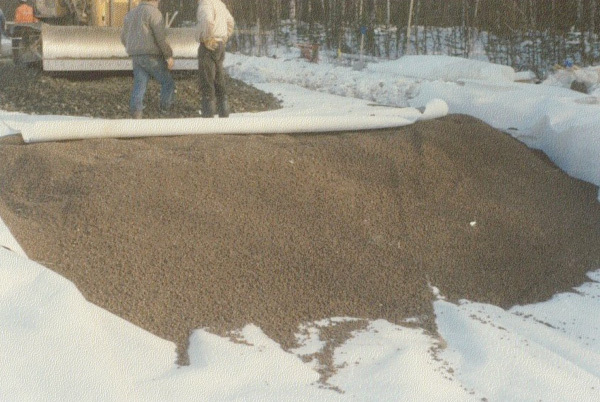 The geotextile separator in the structure should be selected to suit the new basecourse material being laid and strong enough to resist punching by the new aggregate. 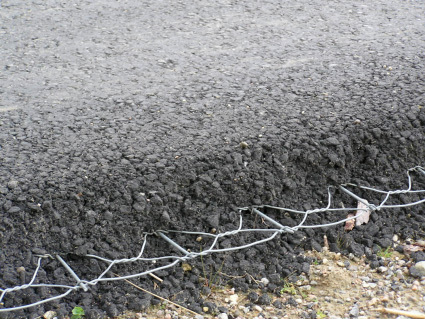 When using steel grid reinforcement in the rehabilitation structure (and this is recommended in all road rehabilitation on peat), the weight of the steel grids must also be included in the weight of the rehabilitation layers. Steel grid reinforcement over culverts, pipes or cables may cause problems for future maintenance operations and should be omitted at these locations or carefully designed to prevent future problems. When used appropriately, a lightweight structure can restore the road profile to its previous level without adding weight to the road and, where circumstances permit, even allow the grade line to be raised. The lightweight material in the new structure should be enclosed by a suitable geotextile separator selected to suit the lightweight fill and strong enough to resist punching by the base course material aggregate. It is recommended that a minimum of 400mm of road construction material is placed on top of the lightweight material to act as a structural layer. This depth will also provides a heat storage mass to counter any variation in icing conditions along the finished carriageway between sections of normal road construction and lightweight fill. This is a major consideration in areas with long cold winters such as in the Northern Periphery. A transition zone is name given to the place where a road changes from a sound subgrade to a peat subgrade. This happens where a road crosses on to peat, and where it leaves the peat. Transition zones regularly cause problems if not treated correctly. The key for an effective transition lies in the creation of a flexible section between the ‘hard’ and the ‘soft’ that will allow the road to adapt to the change in bearing circumstances without undue settlement and cracking. 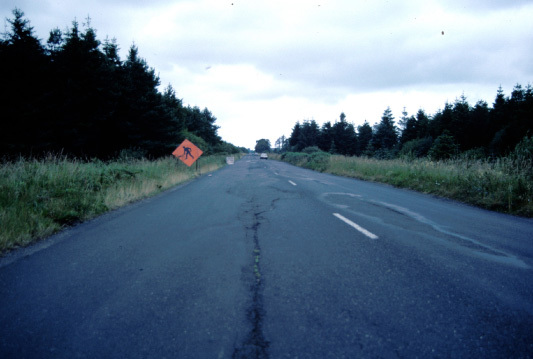 This section deals with the typical road rehabilitation problem of a floating road settling into peat using the general principle of ‘causing no further harm’. In this case the problem lies deeper than the construction layers and the rehabilitation has to include the replacement of some, or all, of the road embankment with lightweight material. The lightweight embankment replacement structure generally follows the same sequence as that of the lightweight structure, but with greater awareness of the need to protect the existing water table and hydrostatic uplift effects on the embankment. These forces are essential to preserve the established equilibrium in the peat and every effort should be made to understand the implications of the changes being proposed and their effects on the permanent works before commencing work. It is usually necessary to remove the old road embankment completely in this process in order to maximize the potential to reduce weight on the peat, i.e. an “unloading” operation. If the the weight of the new embankment can be reduced down to 50% of the weight of the old embankment the resulting rehabilitated road should be free of significant settlement in the future. This rehabilitation solution can also be very effective for raising the gradeline of a road provided that sufficient heavy material can be removed from the existing road to allow for the increase in height with lightweight material. The ‘super lightweight’ properties of expanded polystyrene, EPS, can be very useful in this case and a number of case histories of the use of EPS are given in the ROADEX II report: “Bearing Capacity Problems“. The general principles of widening roads are discussed in the ROADEX IV report “Road Widening”. A common method to widen a road on peat is to excavate out the adjacent peat for the widening and build the new width of road on the exposed firm layer in the recommended fashion, the so-called “legs” solution. This can however be an expensive practice for roads on peat, particularly for ‘floating roads’ over deep peat, and can also pose real problems for the road if the new widened area is allowed to act as a linear drain through the peat. The new fill material can dewater the peat below the existing road and cause unnecessary settlement, consolidation and deformation to the road. A cheaper, and less harmful, solution for widening ‘floating’ low volume roads over peat is by preloading. The construction sequence for widening by preloading is given below. Widening using preloading (Swedish Transport Administration) The red line indicates the new road position. This has been drawn above the existing road for ease of reference. This method can be a cost effective solution where the existing road construction has become stable enough over its lifetime to permit its retention in the new works. A geotechnical input will be needed for this type of widening to estimate the height and duration of the preloading required together with the likely predicted settlement. 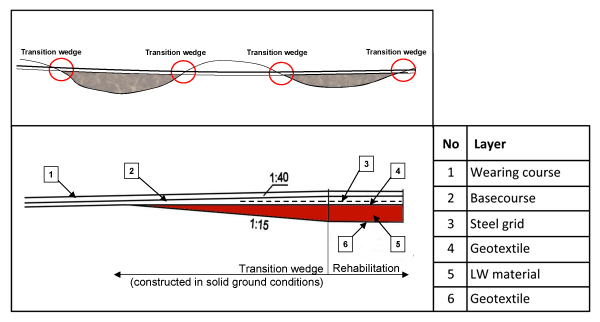 Ideally the new road structural layers should be constructed within the depth of the existing road, as in the “Standard Rehabilitation Structure” in 8.4.2 (a), to avoid adding new load to the peat. If however a higher, or heavier, road is to be built on top of the widened embankment the effects of the increased loadings have to be understood. install the new grid. Polyester grids will require the surface to be sprayed with an adhesion agent. Steel meshes require to be nailed down. 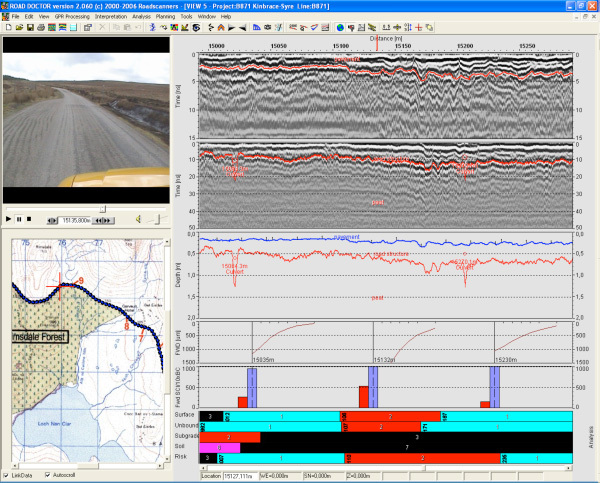 The screen below shows the results of a steel reinforced overlay on a single track paved road in northern Scotland. The steel reinforced section extends from 20540 to 20640 and can be seen in the GPR plot as a blurry area indicating noise feedback from the grid. 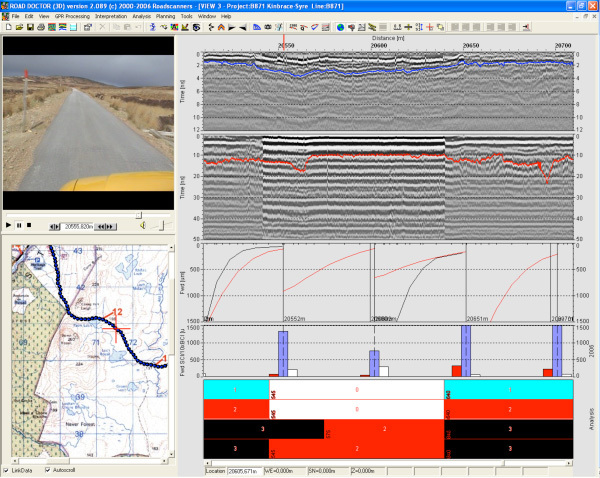 The improvement in pavement performance can be seen in the plots of the FWD taken before the project (black lines) and with the steel grid (red lines). The steel grid used was a Maccaferri twisted steel “Roadmesh”. install the new grid. Polyester grids require the surface to be sprayed with an adhesion agent. Steel meshes require to be nailed down.